Entrepreneurship as a Career option has emerged very fast in the recent times considering the situation of employment in the country. 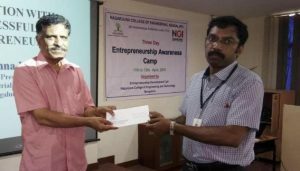 In order to promote entrepreneurship among students, a three-day Entrepreneurship Awareness Camp (EAC) was organized by Nagarjuna College of Engineering and Technology (NCET). The objective of this EAC was to motivate the students towards Entrepreneurship as a Career Choice and enable them to understand the concept of entrepreneurship and also to equip the students with required skills, knowledge and competencies for initiation of Entrepreneurship. The EAC course content included motivational training, entrepreneurial competencies, qualities of entrepreneurship, Product / Technology Selection, Startup / Venture Types and Selection, Business Plan Preparation, Support and Financial Assistance, Venture Experience by Practicing Entrepreneurs and Industrial Visit. The resource expertise for the programme consisted of eminent personalities from various institutes promoting entrepreneurship, Department of Industries, Financial Institutions, Industrial Consultants, Industrial Associations, Behavioral scientists and successful entrepreneurs. 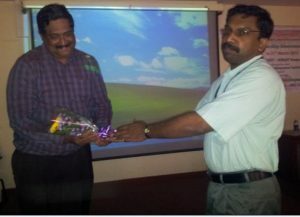 41 B.E students of various branches have participated in this EAC. The EAC was inaugurated by Mr..N.Ramesh, former deputy director, EDII, Bengaluru and Smt.Pavithra Y S, MD, Vindya Informative Pvt Ltd on 11-4-2018. Mr.N.Ramesh stressed the need of attending EA Camp and discussed the technical assistance from National R&D Laboratories for entrepreneurs and highlighted the successful commercialized projects. He also stressed the students to make use of the college laboratory facilities to start their work and requested the college authorities to provide the same. Smt.Pavithra explained the common problems faced by the entrepreneurs and told that the hard and smart work is necessary for the success of any entrepreneurship. The resource persons for this EA Camp are from reputed institutions and successful entrepreneurs. The resource persons for this EA Camp are from reputed institutions and successful entrepreneurs. The valedictory function was held on 13-4-2018 and Smt. 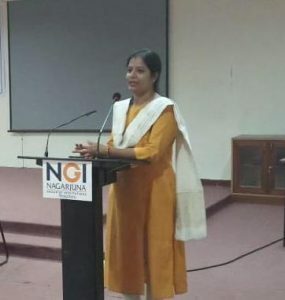 Dhanvanthi Jain, Former President, AWAKE, Bengaluru was the chief guest of the function. She shared his experience as an entrepreneur with the student participants. 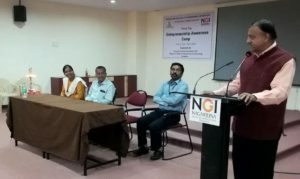 Dr.S.G.Gopala Krishna, Principal, NCET highlighted the initiative taken by the Government of India and universities, to promote the entrepreneurship among the budding Engineers. 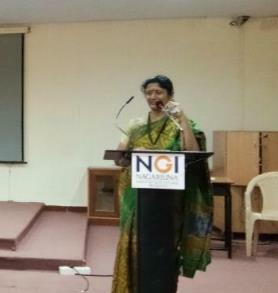 This EAC was coordinated by Dr.N.Kapilan, Coordinator of the Entrepreneurship Development Cell of NCET.